Donald Trump is the President of the United States, while Narendra Damodardas Modi is the 14th Prime Minister of India. The two leaders are often compared because they rule two of the largest democracies – as well as two of the strongest economies – in the world. Both politicians are right-wing-leaning and promote nationalist policies, but they face very different situations in their countries. The US is a developed country and one of the strongest economies worldwide, while India is unevenly developed and – while it is one of the world’s fastest growing economies – it remains well behind the United States in terms of social, political and economic development. India also faces problems linked to over-population, while the United States has seen the national birth rate decrease in the past few years. Despite a number of similarities in their political views, Trump and Modi have very different backgrounds and based their campaigns and political careers on different elements. 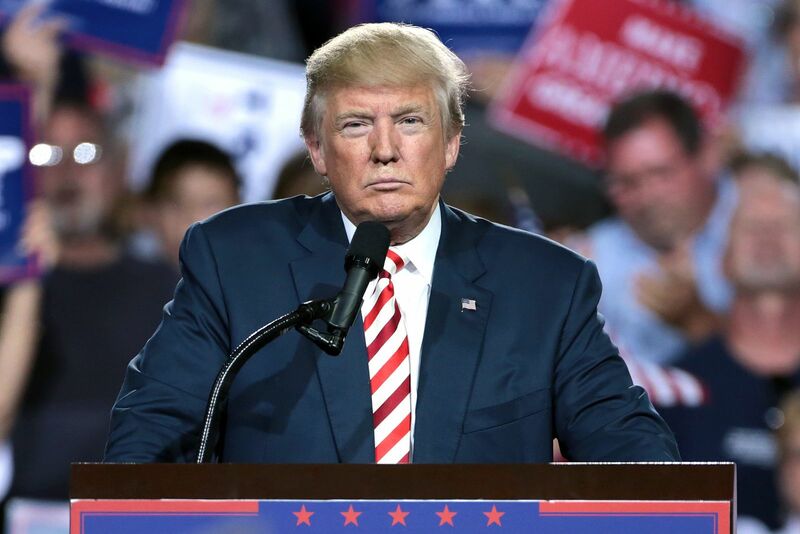 Both politicians have insisted on the importance of promoting their own country and favoring the national economy, but Trump has also highlighted the need of stricter foreign policies and immigration laws, while Modi has mainly focused on domestic problems. Triggering a trade war with China. Abolishing a number of environmental regulations. Both have attempted to modify the national healthcare system. What is the Difference Between Trump and Modi? Despite a number of similarities between the two leaders and their political views, Trump and Modi are very different. Some of the differences between the two stem from the fact that the United States and India are very different countries, despite being two of the largest democracies in the world. Foreign policy: while foreign policy was a key element of Trump’s campaign, Modi has always focused more on domestic policies, trying to reduce poverty and cracking down the black market. Trump’s foreign policy has often been hostile: he withdrew from a number of international agreements, engaged in a war trade with China, imposed new sanctions on Iran, and imposed stricter sanctions on North Korea. Trump also withdrew the US from the United Nations Human Rights Council and questioned the effectiveness of the UN. Conversely, Modi has used a more moderate approach and has travelled extensively across Asia and the entire world to improve relations with a number of countries. He has also tried to attract international funding in order to foster economic growth. 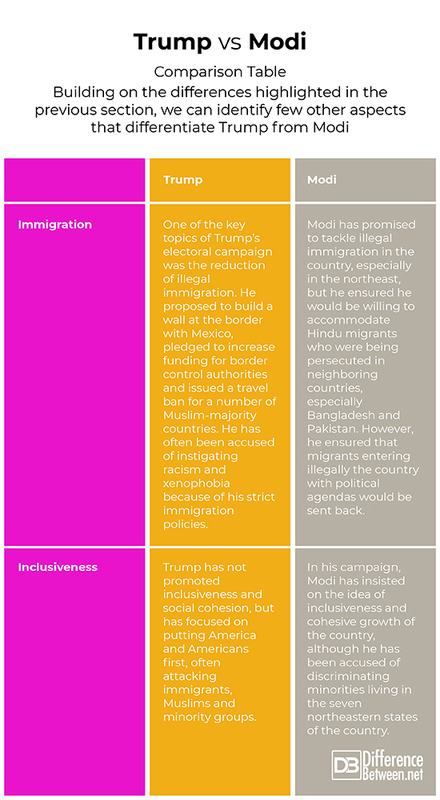 Building on the differences highlighted in the previous section, we can identify few other aspects that differentiate Trump from Modi. Donald Trump and Narendra Modi are often compared for being the leaders of two of the world’s largest democracies. Both politicians are right-wing-leaning and both have shown little interest for environmental laws and climate change. In addition, both have been often criticized both within and outside their parties, and both have taken unpopular decisions. However, despite a number of similarities, Trump and Modi are quite different. Trump has been very aggressive in his foreign policies, withdrawing from international treaties and harshly criticizing other world leaders, while Modi has opted for a more moderate approach in foreign affairs, focusing on improving economic and political ties with several countries, especially in Asia. 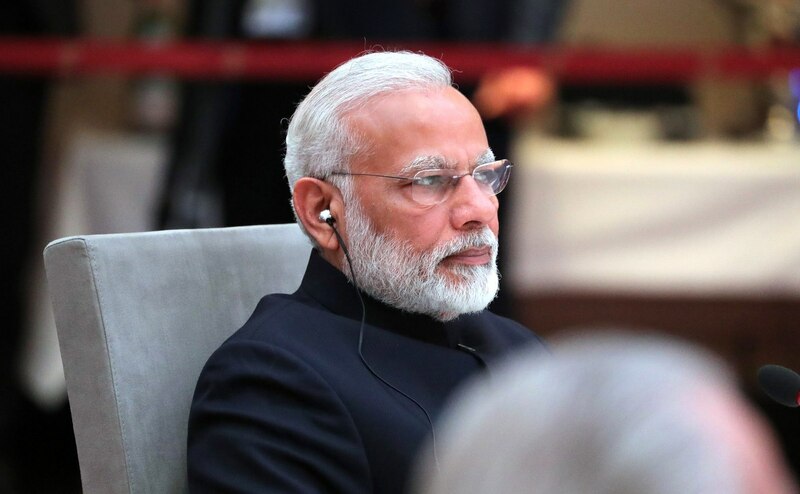 In addition, Modi has become the 14th Prime Minister of India after years of political activity in the RSS party, while Trump has a past as businessman and TV personality, and had showed little interest in politics before deciding to run for elections in 2016. Giulia Squadrin. "Difference Between Trump and Modi." DifferenceBetween.net. December 3, 2018 < http://www.differencebetween.net/miscellaneous/politics/difference-between-trump-and-modi/ >. Clearly, Modi is looking forward to remove family business in politics. Introduction of his own family mates will land him on a total different side of what Trump is! Coll, Steve. "The strongman problem: From Modi to Trump." The New Yorker (2017). Hall, Ian. "Is a ‘Modi doctrine’emerging in Indian foreign policy?." Australian Journal of International Affairs 69.3 (2015): 247-252. Samet, Jonathan M., Thomas A. Burke, and Bernard D. Goldstein. "The Trump administration and the environment—heed the science." (2017): 1182-1188.